This week Focus E15 Mothers showed how London councils are prising out tenants, replacing their homes with expensive private housing. Property guardian companies make this social cleansing possible. Sign at the Carpenter's Estate occupation. Credit: Focus E15 Mothers/Facebook. A group of homeless, under 25-year-old mothers made headlines this week, occupying a boarded up council house in the Carpenters estate in Newham, London. 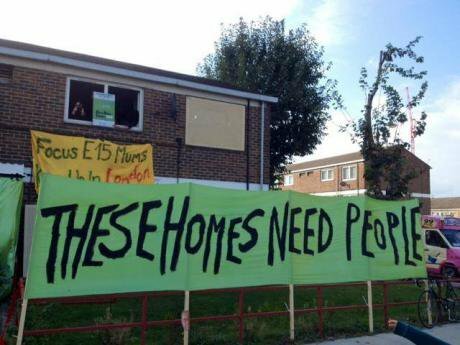 Under the slogan “social housing not social cleansing”, Focus E15 Mothers drew attention to the commercial redevelopment of social housing. Members of the group had been staying at a specialist hostel for homeless women before Newham Council sold it off to private developers, who have turned the building into luxury flats. The council then told the women they would not be rehoused in Newham, but would have to move as far away as Manchester, Birmingham and Hastings. In Newham there are more than 24,000 households on the social housing waiting list. The same thing is happening in other boroughs. Social housing is being snatched from tenants and turned into expensive private housing as local councils cash in on London's inflated property prices. In Clapham, South London, a residential mews called Rectory Gardens is being emptied one household at a time, in spite of the 20,000 people on the social housing waiting list in Lambeth Borough. Henry - who has lived in the street since 1985, despite being classed as a ‘short-life tenant’ - is among those waiting to be rehoused. The council has offered priority rehousing to anyone who agrees to leave Rectory Gardens, ahead of most of the people already waiting. In both Newham and Lambeth, tenants who refuse to accept the new houses offered are classed as 'voluntarily homeless' and entitled to nothing. When Henry leaves, Lambeth Council will almost certainly pay Camelot, a ‘vacant property management’ company, to install short-term, live-in guardians. These property guardians are ordinary people who pay to stay in disused buildings – councils use them to keep out squatters after social housing tenants like Henry have been removed. Henry doesn’t resent property guardians (after all, it’s difficult to find affordable accommodation in London), but he can’t resist explaining to those already living in the mews how harmful their presence is. As a result, one guardian has already quit and moved away. London councils are using property guardians as part of the project to replace social housing tenants with affluent renters. Rectory Gardens is typical. Take into account the level to which property prices in the surrounding area have soared - a three-bed property in a gated development next door sold for £979,000 in May - and it isn’t surprising that Lambeth Council wants the houses back. Lambeth has a unique problem with ‘short-life’ tenancies, which date back to the ‘60s and ‘70s, when the council fired out compulsory purchase orders as part of a poorly budgeted town planning initiative. As part of the initiative, Rectory Gardens was supposed to be demolished and turned into an old people’s home, but the council ran out of money before it reached the street and many others. Not wanting to be lumbered with empty, derelict houses the council let people who had moved in, including squatters, stay on as ‘short-life tenants’. Many are still there forty years later. Left alone, residents formed a housing cooperative with an explicit self-help agenda - members shared skills, repaired each others houses (Jane Wilson, who brought up two children on the street, remembers someone learning to plaster ‘on the job’ on her house), and tamed the communal garden together. While living in the mews Henry was able to go to University, train to be a masseur and set up an art body in Clapham North. Those who were more able supported those who were less so, making “a conscious decision to give back to the community,” Henry says. When occupants left, the houses were passed on to needy friends or nominees. Where the council had failed to provide social housing, people did it themselves. Where incentivising settling hasn’t worked in Rectory Gardens, it’s proved extremely difficult to move people who don’t want to leave. But property guardian companies make it easy for councils to wait while tenants exhaust themselves, financially and emotionally, fighting a lengthy legal battle they are unlikely to win. A London Student investigation that discussed the use of property guardians in clearing Anderson House, an ex-local authority block in Tower Hamlets, found that property guardians tend to be young people without a lot of money who - like the guardians Henry spoke to - are usually naive to the harm they are causing and the extent to which they are being exploited. Although Camelot advertise ‘fees’ (not rent) from £35 per week on their website, in London it’s likely to be far more - £408.90 per month to live in a former care home in Hackney, for example. Guardians fall through the gap between tenants and employees, which means they have none of the rights of either: they can be told to leave at extremely short notice, inspected and warned or fined if they are messy; they can’t spend too many nights out and they can’t bring guests round without booking them in. Guardians placed in Rectory Gardens are lucky, most of the houses have been lovingly restored over several decades, but Jane still affectionately describes the street as ‘ramshackle’. Elsewhere guardians can expect far worse than ramshackle, with Camelot boasting to speculative clients that their guardians are ‘flexible and adventurous’ and can live almost anywhere. Camelot’s disregard for guardian welfare has fuelled a movement against property guardian companies in the Netherlands, where Camelot started in 1993. Abel Heijkamp, from the Dutch organisation Bond Precaire Woonvormen, which campaigns against property guardian - or ‘anti-squat’ - organisations, believes companies like Camelot are “violating tenants’ rights on a massive scale, resulting in a growing group of second class tenants”. Margreet Brinxma, an ex-squatter from Utrecht, makes a good point: property guardian companies are effectively using poor people against themselves. By providing cheap but substandard accommodation, property guardian companies are propping up an unsustainable rental system. In London, Focus E15 Mothers have highlighted the issue of 2000 allegedly habitable properties on the Carpenters Estate left empty and rotting, until the council can say they are unliveable in and need to be demolished. Margreet argues that squatting is a way “to pressure real estate investors who would keep houses empty for speculation and to remind the government of their duty of providing affordable houses”. Property guardian companies are undermining squatting as a political tool and a practical solution to housing crisis by patrolling properties, recruiting would-be squatters and allegedly lobbying European governments to legislate against it. In Newham and in Lambeth, the local council has prised out vulnerable social housing tenants and turned their homes into expensive private housing. For groups like Focus E15 Mothers, and the Rectory Gardens residents, it isn’t just homes that are lost, but priceless support networks and social services too. By helping councils evict their own tenants and making it more difficult to squat, property guardian companies are facilitating social cleansing across London.